(left to right) Team Smart e-Saver members Thomas Brabbs and Joseph Chung receive their prizes from YSD Chief Executive Officer Puan Hajjah Yatela Zainal Abidin, YSD Acting Chairman Tan Sri Dato’ Seri Dr Wan Mohd Zahid Mohd Noordin, YSD Governing Council Member Datin Paduka Zaitoon Dato’ Othman and MDEC Chief Operating Officer Dato’ Ng Wan Peng, with the team’s teacher Bong Poh Kwong and student mentor Ericson Tan. 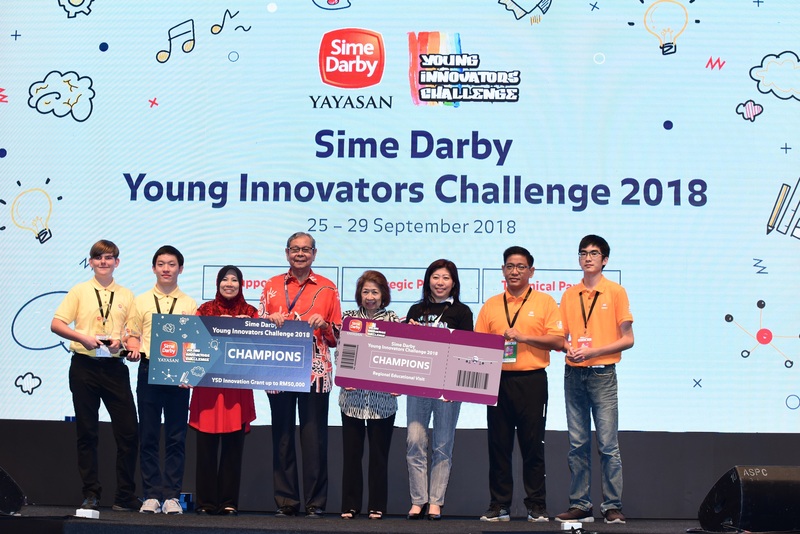 Kuala Lumpur, 29 September 2018 – A prototype to prevent infant deaths after being left in vehicles clinched the top prize at the Sime Darby Young Innovators Challenge (SDYIC) 2018 National Championship. The prototype was developed by Team Smart e-Saver comprising Joseph Chung, 16 years old and Thomas Brabbs, 15 years old from Tunku Putra School, Kuching, Sarawak. This is Chung’s second win at the SDYIC National Championship. Along with this previous team, Chung won the SDYIC 2016 National Championship with the Robin Food app idea. It is now a full-fledged app that connects supermarkets and restaurants to food banks which distributes excess food to the needy. Team Smart e-Saver’s invention beat 14 other prototypes created by teams from schools across 7 states to win the coveted top spot at the National Championship. The winning teams were announced today during a finale event at the #MyDigitalMaker Fair at Axiata Arena in Bukit Jalil, Kuala Lumpur, which was attended by Yayasan Sime Darby (YSD) Acting Chairman Tan Sri Dato’ Seri Dr. Wan Mohd Zahid Mohd Noordin. Tan Sri Wan Mohd Zahid said the innovation challenge provides a platform for students from all over Malaysia to sharpen their thought processes relevant to innovation and empower them to develop innovative solutions for real-world problems, a much needed skill in the country. He commended the strong support extended by 44 secondary schools in Sabah and Universiti Malaysia Sabah (UMS) to participate in the state-level competition towards competing in SDYIC 2018. He said that out of the total 820 participating teams in the state-level Young Innovators Challenge (YIC) 2018 competitions held all over the nation, a total of 150 teams hailed from schools all over Sabah, supported by Universiti Malaysia Sabah (UMS). “The students came from as far as Semporna to participate in the Sabah state-level competition held in Kota Kinabalu. Some had even raised their own funds to cover their travelling expenses to attend the state-level competition,” he said. “I am impressed by their passion to take part in a competition which inculcates innovative thinking and skills in students. This shows the extent of Sabah leadership in education, which has created a culture of earnest determination in wanting to achieve the highest standards in education development, especially towards innovation and problem-solving,” he added. "This is a positive indication that the education system is moving in the right direction to prepare talent for the nation’s future labour market. I am proud to state that we at Sime Darby are doing our part to empower youths to seize opportunities and gain knowledge that will help put them on the path to success,” he said. Team Smart e-Saver designed the prototype after being moved by news articles on babies dying in vehicles after being left by their parents. The invention uses a sensor to detect babies left in vehicles that are switched off and sends a signal to the caretaker’s smartphone that the baby is left in the car. The winning team won a YSD innovation grant up to RM50,000 to develop and upscale their prototype to a viable business solution and a regional educational visit on all things innovation. Team The Saviours from Sekolah Menengah Kebangsaan (SMK) Lutong, Miri, Sarawak which developed a prototype to alert students when their parents are nearby to pick them up from school to prevent traffic build-up, placed second while Team D Bois from Lodge International School, Kuching, Sarawak, which developed a prototype to clear rubbish from clogged drains to prevent flash floods, won third place. The runner up team won a YSD innovation grant worth RM10,000 while the second runner up team won a YSD innovation grant worth RM5,000 to enable further development of their prototypes. The winners were part of 15 teams that qualified for the SDYIC 2018 National Camp which took place from 25 to 28 September 2018. Two teams received the SDYIC 2018 Inspiration Award – Pipitz from SMK Bingkor, Keningau, Sabah and Valiant Esercito from SM Sains Sultan Haji Ahmad Shah from Kuantan, Pahang for developing prototypes to address the plight of needy communities in Malaysia. Pipitz designed an automated mechanism to chase away sparrows from damaging paddy crops so that farmers have more time to spend with their families. Team Valiant Esercito designed a prototype that enables fishermen to dry fish during rainy days so that they may generate more income to sustain their livelihoods. The innovation challenge is co-organised by YSD, social business start-up Chumbaka Sdn Bhd in collaboration with the Ministry of Education (MOE), Malaysia Digital Economy Corporation (MDEC) and supporting partners for the YIC hosting state-level competitions such as Tabung Ekonomi Gagasan Anak Sarawak (TEGAS), Ministry of Education, Science and Technological Research Sarawak (MESTRS), Hap Seng Group in Sabah, Yayasan Hasanah in Perlis, Maybank Labuan in Labuan and Cyberview for schools in Cyberjaya, partnering universities as well as Teach for Malaysia. “The students’ idea, even though simple, addresses a real serious problem out there in the real world,” he added. A total of 2,200 students from 267 secondary schools participated in the SDYIC 2018 programme. With a total of 13 universities involved this year, 242 university students served as mentors to participants from the schools. A total of 200 teachers from 235 secondary schools were also trained to use the Arduino software. Participants had the opportunity to meet industry experts, Science, Technology, Engineering and Mathematics (STEM) professionals and other enthusiasts in the field of innovative technology who provided knowledge, solutions, information on market validation and entrepreneurial skills to the students. The SDYIC 2018 is part of MDEC’s #mydigitalmaker movement, a joint public-private-academia initiative to transform Malaysian youth from digital users to producers in the digital economy. This includes skills such as coding, app development, 3D printing, robotics, embedded programming and data analytics; all of which will ultimately help to strengthen problem solving and creativity amongst our future generation.